$877 million in revenue, 19% GM, 2011 shipment guidance of 2.2 GW. Profit up, but forecast cut hits shares. Policy uncertainty in Italy, a decline in ASP, and a long German winter have made this a difficult quarter for many solar module firms. Th firm's stock is now trading at $7.44, down $0.22 (-2.87%). Over the last 52 weeks, the stock has ranged from a low of $7.05 to a high of $11.41. Suntech posted a Q1 profit of $31.9 million on revenue of $877 million. Total net revenues for the first quarter of 2011 were $877.0 million, down from $945.1 million in the fourth quarter of 2010. Gross profit was $166.9 million and gross margin was 19.0 percent in this quarter -- up from $153.4 million and 16.2 percent, respectively, in the fourth quarter of 2010; and $114.5 million and 19.5 percent, respectively, in the first quarter of 2010. Lower-cost in-house silicon wafers used in production contributed to this improvement. • Total net revenues were $877.0 million in the first quarter of 2011, representing a sequential decrease of 7.2%, and an increase of 49.1% year-over-year. • Total PV shipments decreased 3.1 percent sequentially, and increased 62.9% year-over-year. • Consolidated gross profit margin was 19.0% in the first quarter of 2011, compared to 16.2% in the fourth quarter of 2010 and 19.5% in the first quarter of 2010. • The company has 2.2 gigawatts of PV cell and module capacity, and 1 gigawatt of silicon ingot and wafer capacity as of the end of the first quarter of 2011. Inventory was $550.2 million as of March 31, 2011, compared with $558.2 million as of December 31, 2010. 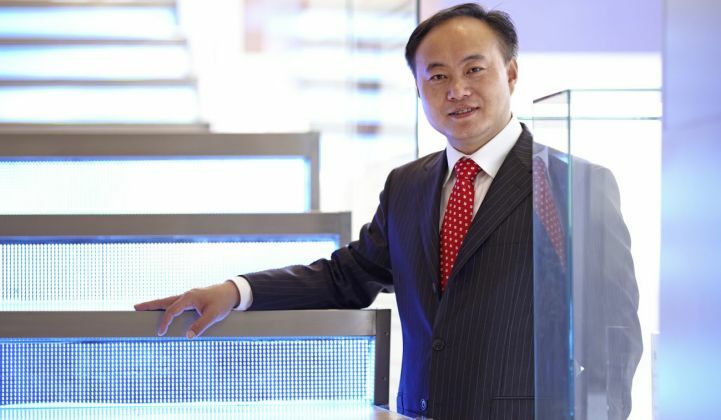 In the second quarter of 2011, Suntech expects low-single-digit growth of PV shipments and relatively flat gross margin compared with the first quarter of 2011. For the fiscal year ending December 31, 2011, Suntech reiterated shipment guidance of 2.2 gigawatts of solar products. Due to pricing pressure, Suntech has revised its full-year revenue guidance to a range of $3.3 billion to $3.5 billion. Consolidated gross margin for the full year 2011 is now expected to be in the high teens. The solar market is going through a rocky stretch. The cap on Italy's incentives in the world's second-largest solar market has slowed the growth of the EU market. And that slowdown has impacted the first quarter performance of solar giants like Trina Solar (NYSE:TSL), Yingli Green Energy (NYSE: YGE), SunPower, and even the mighty First Solar (Nasdaq: FSLR). Shares of First Solar, SunPower (Nasdaq:SPWRA), Trina, and Yingli Green have taken a hit. JA Solar, the second-largest maker of solar cells, expects the second quarter to be soft. Hard times also look to have sealed the fate of Evergreen Solar (NasdaqCM: ESLR) and Energy Conversion Devices (Nasdaq:ENER). Both struggling companies are losing money amidst higher-than-sustainable production costs. Global PV module inventory levels have reached over 10 GW in the second quarter of 2011, the highest amount recorded to date, according to IMS Research. High inventory levels, as well as lower incentive levels in key European markets, have contributed to rapidly decreasing prices during the quarter.